Fall Women’s Prayer Retreat: Praying with the church mothers and Christian mystics Saturday October 6, 2018 10:00am – 4:00 pm Christ Church, Riverton Leader: The Rev. Canon Jayne J. Oasin (Biography below) $10 Suggested donation at the door Sponsored by the ECW of the Diocese of New Jersey. The prayers from other women in our lives — whether known or unknown, can be powerful and life-changing. Whether close relatives or friends or people we barely know, we are being prayed for daily to survive and thrive. In our time together, we will walk those paths laid down by our foremothers such as Mary, Elizabeth, women of the Hebrew Scriptures, the desert mothers, and women mystics such as Hildegard, Julian of Norwich, Teresa and Catherine, to help us feel and develop a richer, deeper prayer life. Whether you breathe a quick prayer for yourself and family as you are dressing for work, meditate regularly, send heartfelt emergency prayers for family and friends in crises or carry a prayer on your lips and in your heart every day, you will find models, guides, and soul mates from among the women we will meet for the first time or get to know better. Throughout the day, we will deepen our own way of connecting more deeply and also get to know other members of our group more deeply. Bring whatever helps you connect with your spirit: paper, notebooks, diaries, writing tools, or the electronics of your choice. Dress in comfortable clothing. Lunch will be provided. Close your eyes and open your hearts to hear the voices of your sisters throughout the ages calling to you. Our goal is for all to depart on the vision of Julian of Norwich: “All will be well, All will be well and every kind of thing will be well.” For more information, contact Allie Graham at allie.graham@gmail.com Register online or by contacting Mary Anne Clisham at 609-394-5281, ext. 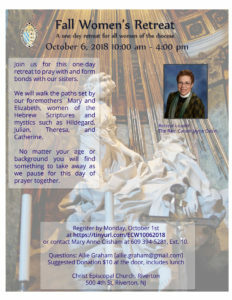 10, or at mclisham@dioceseofnj.org. Biography of the Rev. Canon Jayne J. Oasin The Rev. Canon Jayne Oasin is the former Priest in Charge of the Church of the Atonement, Laurel Springs, NJ. She has also been the Priest Associate at St. Peter’s Church in Medford, NJ, and the Associated Parishes of St. Stephen in Beverly and Riverside, NJ. From 2000 to 2010 she was the Program Officer for Anti-Racism and Gender Equality at the Episcopal Church Center in New York City. Prior to being at the Church Center she held a number of positions in the not-for-profit and public sectors including the City of New York, Planned Parenthood and the YWCA. As a life-long Episcopalian she has been active in her parish and in her home Diocese of New Jersey She has served on Diocesan Council, Urban Ministry Initiative, the 2013 Bishop’s Search Committee for the Diocese of NJ, and the Committee for Ministry with Older Adults, which she co-chairs. She is currently a Supply Priest in several churches in South Jersey. She is a contributor to two books, Women’s Uncommon Prayers, and Race and Prayer. Canon Oasin lives in West Berlin, NJ, and is the mother of two adult daughters and grandmother to much beloved Jackson Arthur Oasin, the newest member of her family.